Woooo-oooo-oooooh. When was the last time you toured a haunted house? Has it been a minute? We're sure you've done it at least once, so you know the rigamarole. Walking through an old house, warehouse, or factory that's been thoroughly decorated and fully staffed with frighteners who are dressed up in all kinds of crazy and very scary outfits. What a blast! Maybe you haven't been to one in a while, or maybe it's an annual tradition, but either way, haunted houses are a revered part of the Halloween season. So, when October 1st pops up on the calendar, maybe you ought to start showing off that you're ready for the big lead-up to Halloween. Our favorite way to show off our fandom is with fun fashion selections, and sometimes it just takes a most excellent accessory to do the trick. Like these Halloween Haunted House Adult Crew Socks! These fun socks are ready to accent any of your October outfits. They'd even be great to wear with a witch costume! Crew cut, the're 98% polyester and 2% spandex. 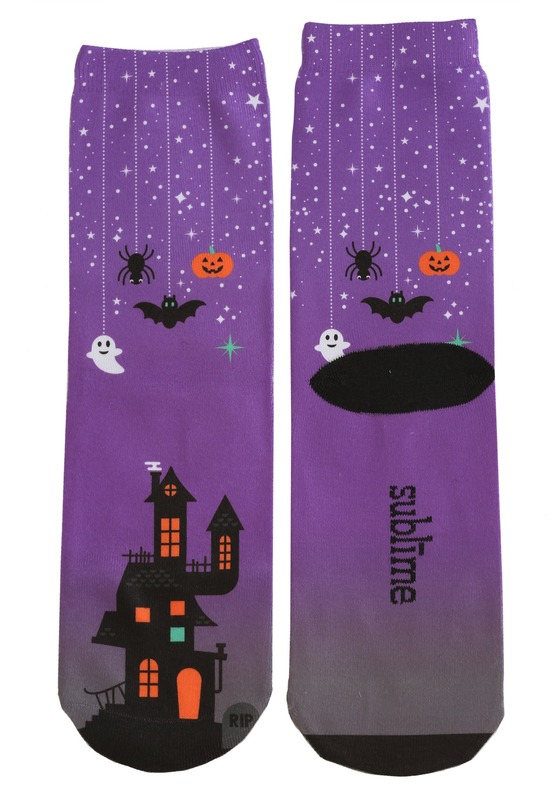 Get these socks ordered and ready for your October fun, and you'll have a fun and spooky way to treat your feet!